"...We support LIVESTRONG and their whole movement to help people with cancer. 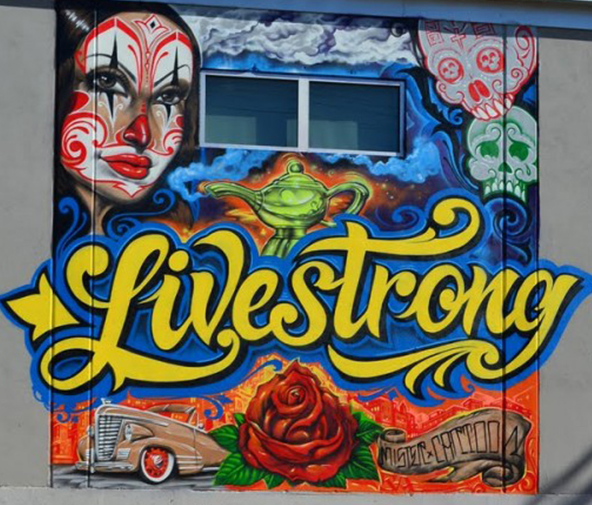 My way to give back is that I went and donated a mural last year on the LIVESTRONG headquarters. Lance let me do it and that’s how you know Lance is a G. I was going to do some bicycle riders and kids in the community and he was like, ‘That’s cool, but that’s not you. You need to do what you want to do out on the wall.’ Like, what? I can put a chick in a LoLo? He’s like, ‘Yeah, this mural’s for the community man, it’s for them.’ So I put a clown woman with a convertible bomb and the roses. I kind of did my mural for that neighborhood."